The Holiday time is a great time to see a movie. And if you were like me years ago, I loved grabbing a movie theater popcorn and diet soda. 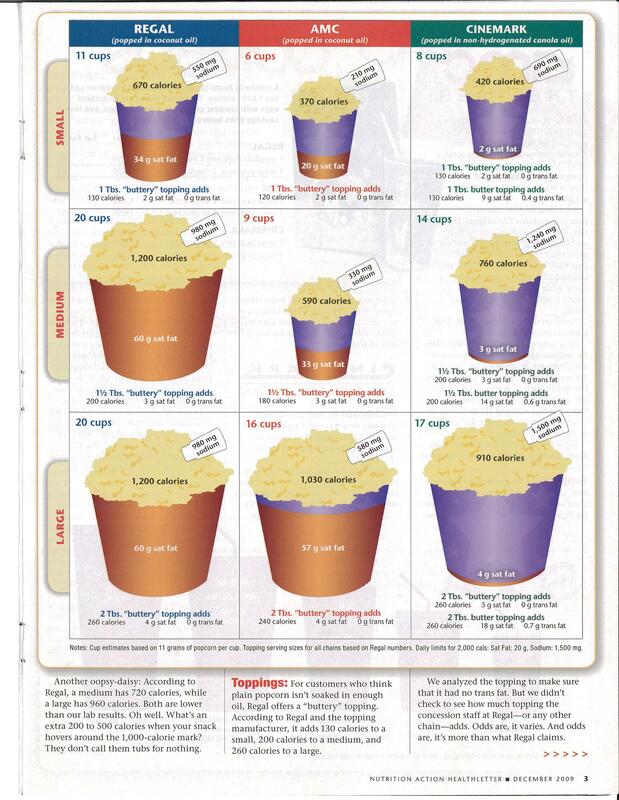 I always thought the popcorn can’t be too bad, maybe 450 calories (I never add that gross pump butter). Add a diet soda, well that is a reasonable treat for the movies right? WRONG!!! In 2009 the Center for Science and Public Intreast shocked me with their Movie Theater Popcorn Story. An average movie theater popcorn and soda has about 1,600 calories and 60 grams of fat, equivalent to six scrambled eggs with cheddar cheese, four strips of bacon and four sausage links. I thought, how could theaters do this? Their response is “Many of our patrons like and enjoy the traditional taste and aroma of theater popcorn, as they have for decades, [and] the movie theater industry has and will continue to respond to our customers’ preferences,” commented the National Association of Theater Owners.” Since I read that quote I share this information over and over again with my clients. I think we all knew movie theater popcorn is not a great choice from a calorie and fat standpoint, but we all had no idea it was that bad! So over the years I have been “bashing” movie theater snacks, until today! Over the weekend I took a break from my Christmas shopping and decided to head in to catch a matinee movie. I had not had lunch yet and thought I would take a look to see if there was anything I could purchase besides a water at the theater. To my surprise there was. 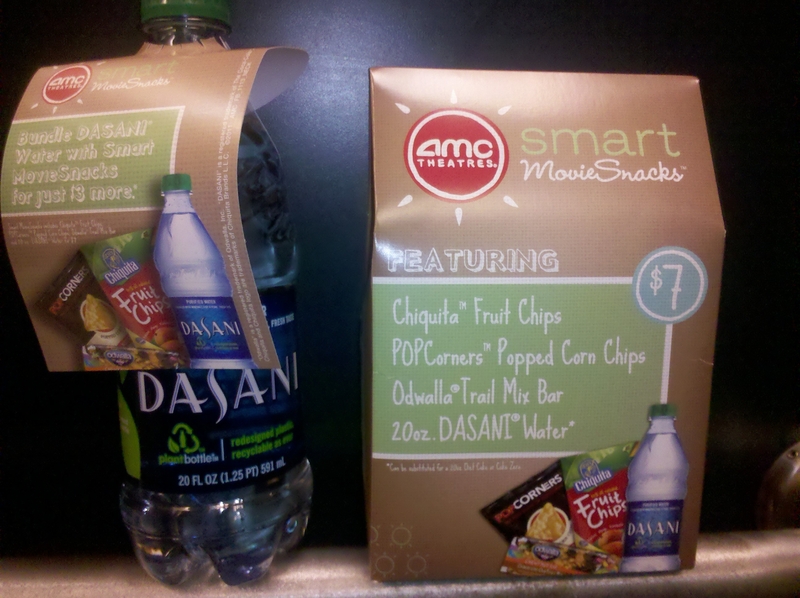 AMC has rolled out Smart Movie Snacks. I guess the Smart Movie Snacks have been out since April 2011, but I have not seen them in my local theater until this month. The Smart Movie Snacks, is a snack bundle featuring ChiquitaTM Fruit Chips, Odwalla® Trail Mix Bar, POPCornersTM Popped Corn, 20 oz. DASANI® water. The new snack bundle has about 450 calories and 10 grams of fat. Compared to the movie theater popcorn with 1,600 calories and 60 grams of fat that is a huge upgrade! My thought when I opened the bundle and dumped the snacks on my lap was “I certainly do not need to eat all 3 snacks right now.” So I opened up my individualize bag of POPCornersTM Popped Corn and enjoyed them along side my bottled water. That snack was only 140 calories, 4 grams of fat and 3 grams of sugar for by 1.1 oz bag. 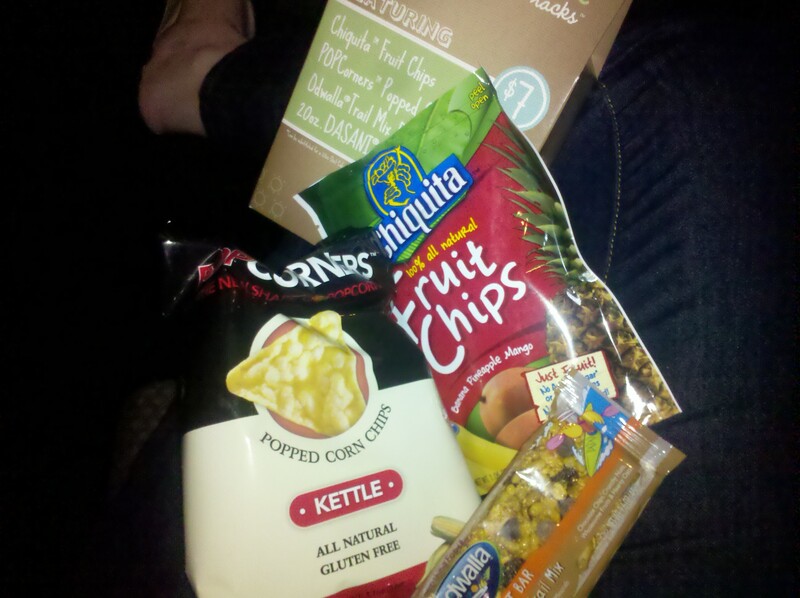 I placed my ChiquitaTM Fruit Chips, and Odwalla® Trail Mix Bar in my bag for later or maybe another trip to the movies. If you were a family or a group of friends, you even could split the Smart Movie Snacks. Each person selecting one snack they enjoyed. The cost of this bundle, I consider reasonable as far as movie theaters go. I paid $7.00 and that included my bottle water. The average cost of a medium popcorn is $4.75 and $5.75 for 24 oz soda for a grand total of $10.75. So choosing a Smart Movie Snack not only will save your waistline 1200 calories, it will also save you cash! Your best option when going to the movies will always be bringing a snack from home, check out my Movie Theater Snack List. But if you are caught in a jam check out the Smart Movie Snacks. The movie theaters said is best, they “will continue to respond to our customers’ preferences”, I challenge you to continue to demand those health options! This entry was posted in Mindful Eating, Snacking and tagged christmas shopping, holiday time, movie theater, theater popcorn. Bookmark the permalink. What a great idea that is seriously long overdue! I am surprised by the amount of food in the pack, but with the reduction in calories and fat along with more food, I think most customers will be pleased! But is it crazy of me to just wish they would make the movie popcorn better for you? Now I know who the brainy one is, I’ll keep lkooing for your posts.